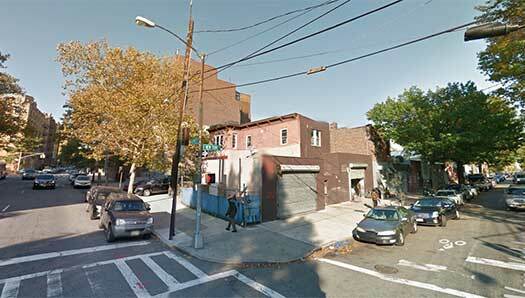 Demolition has begun at the site of a former mechanic shop on East New York Avenue. 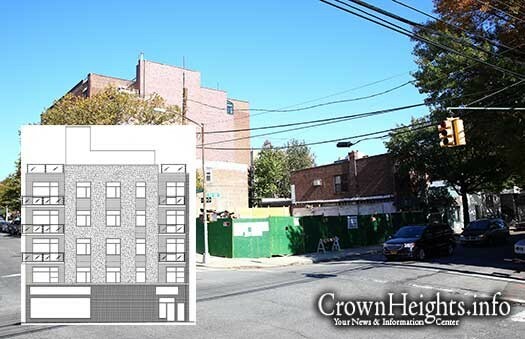 Developers have filed plans for a new five-story, eight-unit apartment building to take its place. 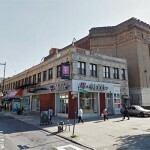 Purchased in November 2014, Rafael ‘Rafi’ Manor’s M Rental Brooklyn, LLC, paid $900,000 for 521 East New York Avenue, a 3067 square foot lot which sits on the comer of Brooklyn and East New York Avenues. The building formerly housed one residential unit and a mechanic shop. 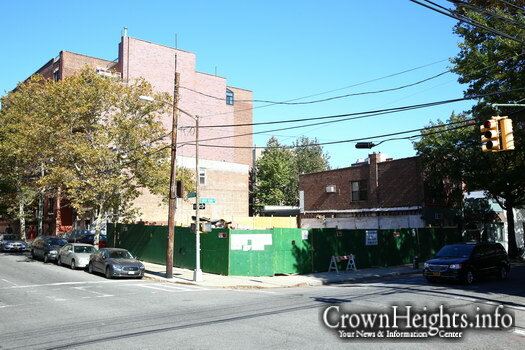 Demolition of the building began a number of weeks ago and stopped abruptly after the Department of Building cited unsafe conditions at the site, including a missing construction fence and the use of heavy machinery without proper permits, among other issues. 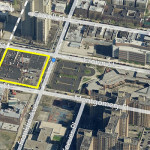 The developer plans to build eight “high-end units” with an average 1,000 square feet per unit and a ground floor “community facility.” There are no plans to build any parking space. 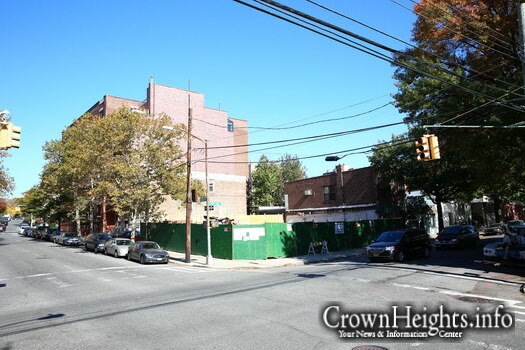 Are these apartments being built for Jewish families? Sukkah, kitchen, enough bedrooms and closet space? High end apartments usually indicates high price and possibly low value for our families. Someone is going to have to speak to him to build it for the Jewish population. High end basically means for yuppies. Please leaders and wealthy individuals PLEASE do something!!! I believe that NY law requires parking spaces for 60% of the number of units. Perhaps there will be space in the back or underneath. He’d better check it out or face consequences. And a reality check would expect him to put in at least that many spaces. I hope its Fischer. Affordable. 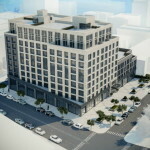 Fisher is building one corner over on Brooklyn and Maple. He is also the only one that is building with Yiddishe families in mind, unlike *any* of the other CH landlords. Maybe it’s time to change our attitude. 1000 sq.ft. is probably only a small 2 bedroom unit. Instead of thinking yuppies, think seniors. There are seniors who would love to exchange their large homes for a small unit, without the noise and commotion of living in a large building. A communal area on the ground floor ? How about space for davening, shiurim, activities, a library, place where the elderly can socialize. As for the young families, if some of the older ones move into smaller homes, there will be more larger homes available. Great idea!! CH needs something like what you’re suggesting. There are not only young families in this community, but many aging adults as well. As you so rightly point out, some of them don’t want to maintain a house. I’ve semi-joked with friends about eventually pooling our resources and opening a commune-style home for a handful of aging women who will look after each other. YIDDEN! WAKE UP ! ITS UP TO US! we need to stage a protest. Our community council is ineffective. Lets get together to sop this .YUPPIES BRING PRITZUS TO OUR COMMUNITY!!! YUPPIES ARE RUINING THE FUTURE OF OUR NEIGHBERHOOD ! ?OUR YOUNG PEOPLE ARE BEING PRICED OUT ! we should not let developers ruin things ! LETS GET TOGETHER! WHO WILL LEAD US! Maybe work a bit harder and send your kids to college or university after OT so then when they get married and have kids they can afford to buy a house in Brooklyn! There is only ONE, that’s right, ONE developer who still builds condos for Jewish families, and his name is David Fisher. Fisher has sold them below market value to ensure that Jewish families can purchase them. All other developers are building apartments for yuppies. It’s very easy to tell. There is one sink in the kitchen, no place for a Sukkah, and the sizes are too small for families. What goes around comes around. This community fought and kicked out the only people that can make a difference. Now we are paying the price. hey the aging CH angle is interesting – thanks for bringing it up. My inlaw would appreciate living in this bldg. iy”h as its a nice quiet part of town, and they don’t drive so parking is not a problem. I wonder if they have an elevator though. Really should have 2 elevators, so one can be set as Shabbos elevator while the other one is left on regular. This way if hatzala has to get up on Shabbos they don’t have to use the stairs. Also space for small sukka. and the option of small Pesach kitchen for those who prefer to sleep in their own beds even on Pesach. 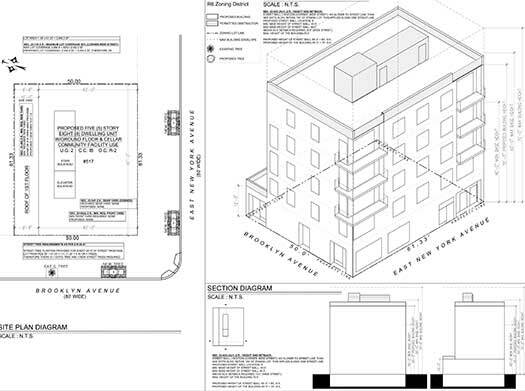 Hope they read these comments, whoever is planning new buildings. Baruch Dayan Emes this is terrible and sad news that’s a fact no need to “hope” other wise may we hear only good news and may the new satan that is hiding behind the yuppies rot in gehenm!!! 15 Tamuz 5745. Free Translation. As stated earlier, we want to seize the opportunity to accomplish whatever we can when we still have the advantage of קיימא סיהרא באשלמותא (“the moon is complete,” i.e., the fifteenth day of the month), and being that the night follows the previous day [in certain aspects], this advantage is present now as well. According to halachah, when it comes to participating in a wedding, even six hundred thousand and more are obligated to participate and bring joy to the chassan and kallah. Yet, being that we are in golus, a glass is broken. One of the reasons for this is to remind us that [our happiness is incomplete, because]אז ימלא שחוק פינו – “Then our mouths will be filled with laughter,” the word ימלא being written in the future tense, referring to the coming of Moshiach Tzidkeinu who will bring the true and complete ge’ulah. The above serves as an example to the present situation as well, and we must unfortunately now discuss something which can be compared to “breaking a glass.” However, we will attempt to discuss it in as short a manner as possible and limit our words to what is necessary. As discussed above, we find ourselves in a time when זרעו בחיים – “his offspring are alive,” and הוא בחיים – “he is alive” [referring to the Frierdiker Rebbe and his chassidim.] And to the contrary: as the years pass, the [Frierdiker Rebbe’s] “offspring” increase in life ([in keeping with the instruction] to increase in matters of holiness) by increasing in studying Torah and performing mitzvos according to the directives given to them by the Frierdiker Rebbe. As such, the fact that “he is alive” is all that more apparent. The emphasis in this statement is [that he is found] “in all the worlds,” which means—unlike the simple meaning of the Zohar, that this refers to other worlds—that he is found in this physical and materialistic world even more than he was when he was alive. This is the understanding of the [above-mentioned] Igeres Hakodesh section 27 and its [subsequent] bi’ur. Additionally, [there exist] lengthy explanations on this [letter], especially as can be understood from the maamorim of the Rebbeim who followed the Alter Rebbe. [To preface: 770] is the house where the [Frierdiker Rebbe] spent the last ten years of his life. It is the place where he studied and davened, and it is here where he ate, drank, and slept, which are [activities] by which a wise man can be recognized, as the Rambam writes. [This is true regarding] any wise man; all the more so wisdom connected to a leader of the generation! As can be easily understood, even though [we find ourselves in] golus and are restricted by limitations, we must do whatever we can so that it should be apparent that an increase [in the above is taking place] in the area surrounding these daled amos (which include the entire house, courtyard, and so on). [The following message] is therefore being given over: Individuals who are down-to-earth and practical should hold an urgent meeting—and the opportunity should be seized as early as tonight (when the advantage of קיימא סיהרא באשלמותא is still present, because the night follows the previous day)—to begin making plans how to improve (bederech hateva) the houses that are already found in this neighborhood. Those houses that are already fit for human residence should be made fit for human residence in an expansive manner, and those that were not fit for human residence should be made fit for human residence. Ideas should be considered—bederech hateva—to build houses and buildings wherever there is an empty lot, so that people who follow in the ways of [the Frierdiker Rebbe] can settle there. The [Frierdiker Rebbe, who was] arrested and released [on Yud Beis Tammuz,] will surely help [in the implementation of these plans], and furthermore—it is certain that success will be achieved. In these houses, the Torah of [the Frierdiker Rebbe] will be studied along with all other parts of Torah, and mitzvos will be performed along with those mitzvos which the Frierdiker Rebbe emphasized particularly. Certain people mistakenly believe that when building a house in this neighborhood, they must collect as much money as possible, because after all, the buyer will certainly pay the money he demands, because he desires to live in this house! In truth, the correct conduct should be to be mekadesh the name of this neighborhood, by showing how it is a place where one can settle easily. It should be a place where one does not have to search for diverse and bizarre ideas how to obtain the large amount of money required to buy or rent a residence, and even after the money is obtained, the seller provides a second-rate residence that is missing this amenity or that amenity, and when the buyer comes to complain, the seller replies: “You’re even complaining?! You’re living in the neighborhood of the Frierdiker Rebbe, the leader of our generation! Even if you were to live in a hut, you should still be paying many times this amount! All the more so when we do you a favor and supply you with a residence—perhaps a substandard and dreadful one, where the roof leaks and the floor is not the way it should be, [but a residence nonetheless]! !” [More can be said about this, but] there is no reason to speak at length regarding painful, shocking matters. This is one of the phenomena that accomplishes the opposite of kiruv rechokim, and results in the opposite of kiruv to those who are kerovim! These people definitely have good intentions—to obtain more money to use for positive things. But one should not obtain money by bringing about difficulties in the life of another Jew, and a difficulty of the type that Hashem did not place upon him! The Alter Rebbe rules in Igeres Hakodesh that one cannot cause a problem for another Jew, and even for a non-Jew. For if it has been decreed from Above that the other will suffer, Hashem has many messengers [and He will ensure that it will transpire nonetheless], and if he won’t be the one to cause him suffering and squeeze out the money from him, than another will do it, because it has already been decreed as such from Above! He doesn’t have the power to bring about a new decree; it must be that it has been decreed that the other will lose the money either way! And being that this is the case, why should he allow another to be the one who will squeeze out the money from him, let him be the one to serve as Hashem’s messenger and squeeze out the money, cause him pain and suffering, and upset his shalom bayis! And he has a claim to substantiate his actions: this is what it says in Igeres Hakodesh! This can be compared to the conduct in Sedom: in Sedom, if one person caused another to bleed, he would demand compensation, claiming that he would have had to pay a doctor to let out blood, and he did it instead, so he should be paid for letting out blood! And the same is true here. However, the Alter Rebbe immediately rules out this claim: Yes, it’s true that the other would have undergone the suffering regardless; but he must know that the reason he is acting in this manner is (not because he wants to serve as Hashem’s messenger, but) due to רוע בחירתו – his evil choice! That’s the wording used by the Alter Rebbe! Hashem gave a Jew a unique power—the power of complete free choice, just like atzmus u’mehus, so to speak. As it says in Lekutei Torah, no one else has free choice to such a degree, other than atzmus u’mehus and a Jew. And Hashem wants a Jew to use his bechirah, which is exclusively his—הכל בידי שמים חוץ מיראת שמים—to choose life (ובחרת בחיים). [Hashem wants that a Jew] should make his bechirah be one of life, by choosing to bring life to another, and to bring life to himself! And instead, he took his bechirah and made it one of evil! If he would have merely used his faculty of action for evil, one would be able to rationalize [his conduct], because when it comes to the faculty of action, a human and an animal are alike. As Chassidus explains at length, when it comes to action, a human—although endowed with the power of speech and intellect—is the same as an animal, and the difference between the two begins with speech, thought, and so on. But Chassidus continues to emphasize and explain that bechirah does not exist by angels, serafim, ofanim, chayos hakodesh, or by any other level in all the worlds. This is how Chassidus rules on the matter, and it’s also implied as such in Moreh Nevuchim (referenced in Lekutei Torah). And yet, he comes along and uses this power, in which he is similar to Hashem himself, for an evil choice! Being that we are found in the great darkness of golus, he’s in the category of a tinok shenishba lebain ha’akum with regard to this matter, and he is therefore subject to the above-mentioned persuasions, excuses, and so on. But from now on it will be different. However, we can’t wait until he performs complete teshuvah and rely only on the individuals who have acted in such a manner; instead we should immediately devote ourselves to the issue with a shturem by holding an initial urgent meeting (as stated above) with those individuals to whom this matter has been addressed before. [The meeting should be held] tonight, which still possesses the advantage of קיימא סיהרא באשלמותא of the fifteenth day of the month, being that the night follows the previous day [as stated above]. This is the issue I wanted to seize the opportunity to address when the advantage of קיימא סיהרא באשלמותא is still present. I have already spoken with certain individuals and instructed them to hold an urgent meeting, [urgent] but also held in a calm and in an orderly fashion, to discuss plans to erect buildings, renovate and improve them, and the like. They should also think of solutions so that the cost of housing for one who desires to move to this neighborhood should be on the average side. Even better, the prices should be bechesed u’berachamim, because this is the neighborhood of the Frierdiker Rebbe, who made a condition with his father when accepting the nesi’us that he is accepting the nesi’us because it will be bechesed u’berachamim, and he indeed accomplished that it should be this way. And together with this, the residence should be an attractive one, which broadens one’s mind (as the gemara rules in the end and conclusion of maseches Berachos). When the above is accomplished, not only will these daled amos of nesi doreinu not be affected in a negative manner, but to the contrary: it has been thirty-five years in which his sovereignty and control increases as each year passes, and הוא בחיים, יתיר מבחיוהי. This will also affect חיוהי—his life—as explained in simple terms in Igeres Hakodesh: his life as it pertains to physical concepts in this physical and materialistic world in general, and particularly as it pertains to the place where he resided for ten years of his life, along with the limitations of a body. Nothing in this world is totally negative, and it is certain that there is something positive [in the Frierdiker Rebbe’s histalkus]. The positive aspect is the fact that now he is alive more than before—יתיר מבחיוהי: in the very same place where until then he was present only to a certain extent, he is now found יתיר במחיוהי. And with each passing year this has increased more and more, in keeping with the rule that one must להעלות בקודש – increase in matters of holiness. It is certain that there is no need to speak more about this matter. More should be said about the topic, but everyone will act [in this matter] as he understands.